1) Upholding intellectual property for designers such as @yiyinglu, because the creatives in advertising and product development have relatively little power these days. 3) Making my first media buy...@ev has 14,412 followers, 20 t-shirts to outfit twitter cost $361.17 sponsored in part by the failwhale fanclub. That translates into the following in media buying terms: a $25.06 CPM, @yiyinglu will let me know how many shirts are sold = CPA, and maybe zazzle can help me find the CPC. 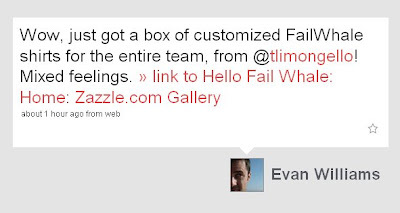 Summize can then tell me the word of mouth effect which would be enormous, because there's already many people retweeting @ev here's the Summize feed for the keyword "FailWhale" http://summize.com/search?q=failwhale. It would have sucked if @ev didn't tweet about it, so really it was more like buying a call, but that's moot. Thanks for making the experiment work @ev! . One thing I'd love to know is - how many impressions were mobile? Basically this all started when I made my own FailWhale t-shirt and got a huge reception from people at Internet Week in NYC during the first week of June.